The American Association of Wedding Officiants is a professional group of wedding ministers, officiants, celebrants, and Justices of the Peace that ecourages education and professionalism among its members. This blog is a collaborative effort, with members submitting articles, ideas, and blog posts! Oh Say Is That My Photographer? What a Great New Jersey Wedding! Please contact Jessie Blum with any questions, comments, submitted blog posts, or anything else! If you have attended a wedding lately you have, no doubt, noticed that the art of the Wedding Ceremony has become the art of the Wedding Ceremonies. Special ceremonies, such as Unity Candles and Blending Sands, to name just two, have become so commonplace that you would be hard-pressed to attend a wedding today that does not include at least one ceremony within the ceremony. As today’s wedding couples take a much more involved role in planning the event, their weddings increasingly reflect their personal tastes and preferences. A couple who, for example, have children from a previous marriage, may want to include them in the ceremony in a very prominent and important way. Many ceremonies have been created over the years to accommodate these unique situations and blend them, hopefully seamlessly, into the wedding ceremony itself. 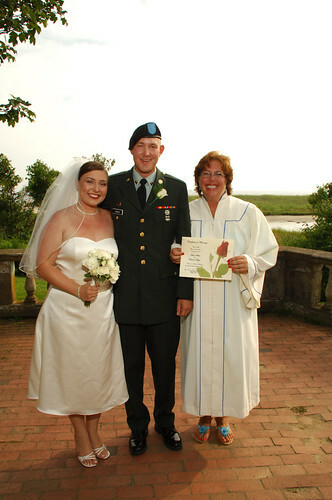 A special ceremony can be created to celebrate almost any unique situation. One such ceremony that I am particularly fond of (possibly because I wrote it) is called “Jumping the Line”. I created the Jumping the Line ceremony for the weddings of Police Officers and Fire Fighters as a way to incorporate their love for their chosen profession into the most important and love-filled day of their lives; their wedding day! The Thin Blue Line (Police) or The Thin Red Line (Firefighters) has come to represent that the individual is a member of the Police or Fire profession. A couple who jumps the line together, symbolizes that the spouse, who is not a member of the profession, acknowledges the duty, honor, respect, and responsibility that goes with the badge and accepts that he or she is now a permanent part of that life. And since both professions are firmly entrenched in the belief that you must protect and defend your partner as if he or she were family, jumping the line together also symbolizes that the newlyweds are not only husband and wife, but partners as well – in the truest sense of the word! A variation on this theme could include the Thin Green Line for military personnel. It is suggested that this mini-ceremony should be performed as the final act of the Wedding Ceremony and immediately before the pronouncement as man and wife. However, it can also be performed immediately after the pronouncement and before the Introduction of the Newlyweds. As it parallels the “Jumping the Broom” ceremony, it is suggested that an appropriately colored (and possibly decorated) stick be used to create the line. A blue or red ribbon, colored chalk, or other blue item of your choice can certainly be substituted. Clergy: “I’m sure it comes as no surprise to any of you that Groom (Bride) is a Police Officer (Fire Fighter), and that he (she) loves his (her) job – so it should also come as no surprise that he (she) wanted to include that part of his (her) life into this; the celebration of the most important day of his (her) life. We have all heard of the Thin Blue Line (and the Thin Red Line). Although it is just a simple, understated, colored line, it represents membership in a highly respected profession. It also symbolizes the duty, honor, respect, and responsibility that goes with that job and which carries over into the personal lives of every member. Clergy places stick on ground in front of couple or points to colored line which was placed before ceremony began. “It gives me great pleasure at this time to present to you the newlyweds, and partners for life; Bride and Groom Lastname. If performed after the pronouncement then say only: “It gives me great pleasure at this time to present to you the newlyweds, and partners for life; Groom and Bride Smith. On the photographer front I must make some personal observations having worked with hundreds of them…There are nice ones and well…. GET RECOMMENDATIONS FROM THE BRIDES THEMSELVES. Ask for 3 of their latest brides and ask for their phone numbers. You will not believe how condescending some “artist”/people can be. Bottom line is apparently some vendors don’t realize we all breathe the same air! What you don’t want is someone who barely communicates and then on your big day they become brusque and demanding. There is never a reason for vendors to be curt. The trailer I saw of “Marley and Me” had me laughing from the start. Pets do bring warmth and joy and humor … as well as challenges … that can make life better. 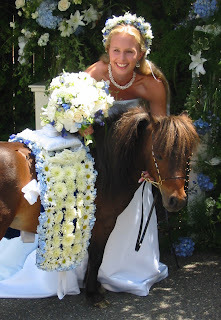 And many Seattle brides and grooms are inviting their dogs or miniature horse (meet “Rocky”) or parrot or other much loved “companion” to be a part of their wedding ceremonies. Flowerpups and ringbearing dogs bring the characteristics of their personalities to the ceremony. Some are playful and lively, some are dainty and precious, some have elan and chic. My husband, Kent, officiated at a wedding where a miniature fur friend wore a spritely pink tutu. She enjoyed it immensely and was so delighted to be with her family. Absolutely adorable! 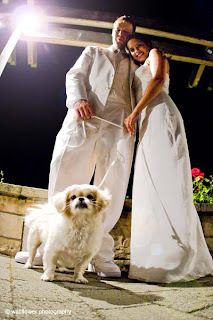 At one of my ceremonies, the couple was active in the rescue of greyhounds. Two of their friends escorted their dogs to their beds of honor on either side of the bride and groom. It was quite an elegant entrance and the greyhounds brought a stately presence to the processional and the ceremony itself. Here are some thoughts to consider when deciding whether your pet would be a welcome addition to your wedding ceremony. Does your pet enjoy being around people, possibly a lot of people? Each animal has a personality and a tolerance for next places and people. We shared our home for many years with Mara, a Siamese/Tabby mix who was extremely people oriented. She would greet me at the driveway when I returned from errands and would follow me around in the house and accompany me when I tended our garden. At times, she even enjoyed taking a walk around the block. And she was alreadys ready to be petted and cuddled and loved to play. Our other cat, Callie, was quite the opposite: staying out of view until all was quiet and she could make her way directly to our laps for much desired attention. She needed privacy and serenity to show herself. 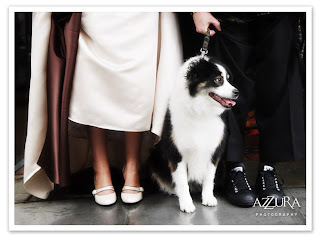 Is there someone you trust to take care of your pet’s needs during the ceremony? Someone your pet knows and enjoys being with? And afterwards who can bring them home or to where they will be residing while you are on your honeymoon? You will have so much happening on your wedding day. It is important that your pet have a dedicated person or two to reassure and notice what is needed. Water, walk, a quieter place to relax and to be fed. 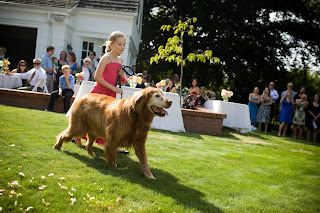 A happy pet makes a much happier wedding day. What provides comfort for your pet? Perhaps it is favorite bedding or a toy or a certain treat? Does he or she have a certain schedule? When is nap time? Keeping to the normal pattern of life as closely as possible and providing familiar items assure your buddy that all is well. Is your pet ready to be in the limelight? Is she or he well trained? Does the breed have the temperament to repose near you? To be trusted around lace and delicate materials? To be in your presence and still respond to a handler during the ceremony? You know your pet. What are her capabilities. Be honest and kind. Ask of your pet only what is possible and probable. A few surprises are endearing; expecting the impossible is stressful. Is the outfit you have selected comfortable for your pet? Some garb is exquisite and some of our companions love to show their stuff. Perhaps a trial run will indicate if the attire fits well and will be tolerated for an hour or so. If your fur baby isn’t ready for the wedding itself, it is always possible to include them in the engagement photographs, as well as the getting ready and post-ceremony pics. Your treasured companion can be included in your wedding photographs in a way that is fun for everyone! And sometimes there is a serendipity about our interactions with our animal compatriots. 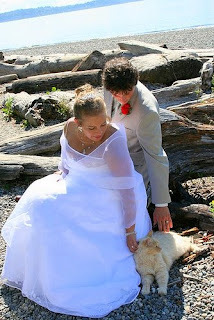 This couple has known this cat forever although it is not theirs. At one time, they lived near the beach and would pet the cat on their visits. They called it Aslan (from The Lion, The Witch and The Wardrobe). Aslan coming to see them was like its blessing on their union. How can we leave this topic without mentioning two quite famous creatures: Basil and Borage of The Willows Lodge and The Herb Farm. Adored by all who see them, these two have witnessed more ceremonies than most people I know. I always stop by to visit with them after my ceremonies. Not certain if any of the vows bring tears to their eyes but I like to think they are touched in some way by the sentiments! 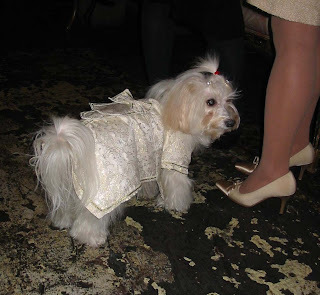 Yes, our pets do bring an element of “humanity” to our ceremonies … and we thank them for that. Make plans to include your companions in ways that suit them best. Purchase recycled paper to print your invitations and programs on or purchase them from someone who does use recycled paper. Send your invitations in a picture attachment to emails when you can. Explain why you are doing this to avoid hurt feelings. (Not only will this save paper, but postage costs and the fuel used to transport mailings). Establish a wedding website (most are free) and communicate though that with your wedding party and for RSVP’s from invited guests. Ask them (and all vendors) what they are doing to minimize waste, conserve water and reduce energy use. Are they recycling? Do they use LED lighting? 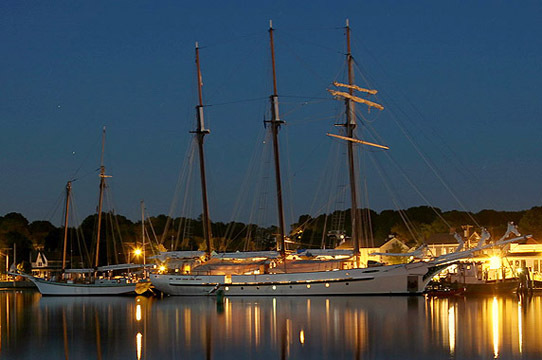 Can you use the same location for both the ceremony and reception? This reduces your costs, and cuts down on transportation waste. Is your caterer using food from local markets to reduce carbon emissions? Do they use food that is organic, pesticide-free, or cage-free? Ask the cake decorator if they use fair trade sugar and dried fruits. Even if the vendor isn’t doing much now, you could get them thinking. Rent as many things as you can, including linens, silverware, table service, aisle runner and centerpieces. Buy never used and slightly used items for your wedding at bravobride.com. It’s like Ebay, but for your wedding. You can then earn some of your expenses back after the wedding by selling your items you no longer want or need. Traditions have for the most part remained the same over the last 100 years but couples have been personalizing some of the standard ones in recent years. With more couples being married outside the church and in the great outdoors, the unity candle has become a challenge. We have heard ideas like drill out the center of the candles and insert the trick birthday candles so if blown out they will relight again and again. Also couples have moved on to sand ceremonies, unity bouquets even the mixing of wines. Here we see a sand ceremony coupled with their own tradition of jumping sugar cane. Both families are from sugar producing islands and sugar cane has always been a happy and positive entity in their lives. Rituals also provide an excellent opportunity to include family. Here we have a couple both with three children by utilizing a unity candle the youngest each lit a candle and passed the flame to the next until reaching the parents whom in turn lit the unity candle. When planning a ceremony speak with your experienced Officiant – ideas and challenges for new ideas are always shared among them. Who doesn’t want to save money on their wedding? Unless your name is Trump, Rockefeller or Hilton, you probably do. But is cutting corners the wisest way to go? In this economy DIY is the only way many couples can afford to even get close to their dream wedding. Let’s face it, weddings are expensive! I think that it’s a personal choice per couple. If going this route, each couple needs to decide which things are the most important to them and spend the larger parts of their budget there. Anything that they are going to try on their own should only be attempted if it won’t “crush them” if it doesn’t go as planned, or if they have a KNOWLEDGEABLE family or friend member willing to help. Ask to see examples of their work to be certain they are going to do things your way. If you don’t like how they do it, you aren’t locked in. Deciding to go with a professional will save you heartache, because it can’t be redone. However, if Aunt Paula is awesome at cake making and wants to help, by all means, take advantage of that opportunity! I hear horror stories about couples that tried to save money by having a friend ordained online to marry them. This is fine if your friend is a great public speaker and writer, with some knowledge of how to put a ceremony together. However, I have bailed out a couple that had the person back out a month before the wedding with nothing done; and heard about the cousin that had a “couple of nerve calmers” before the ceremony and had to leave during the service for a minute to use the facilities! If you want something done right you have to do it yourself. This belief leads people to hold on to too much. Unfortunately, people who cling to this belief often become an organizational bottleneck. Everything has to be done by, or through, them. It is hard for some brides to emotionally detatch themselves from every aspect of their wedding, so they decide to take care of it all. Those are the ones that end up extremely stressed out, things don’t turn out the way they wanted, and ultimately they didn’t enjoy their wedding day. I think every aspect of the wedding can be a DIY, but not every aspect for every wedding. Unity Ceremonies are not only for a joining together of two individuals but may also depict a merger of families, cultures and traditions. Candles, colored sand, flowers and sometimes a special beverage may be used as symbols depicting this joining. Our Bride Peggy hails from Newfoundland where the drink of choice is SCREECH, a dark and flavourful rum (you can imagine how it got it’s name) and so it is most appropriate that what is also called “Newfie Holy Water” was included as part of their wedding ceremony! The Bride drinks... the Groom drinks... and then the JP gets in on it, too! Birdseed – Always nice to feed a few birds on your wedding day, but trying to get all that birdseed out of your hair is a nightmare and some facilities may feel the same way about birdseed as they do about rice! Bubbles – Fun and whimsical. They can be purchased in small favor sized bottles and even customized with the wedding information. Check your local Dollar Store for the best prices!! Butterflies – Beautiful thought to send butterflies free to fly around you, but you have to make sure the boxes you receive contain live butterflies and that you have enough to even be seen. Be sure to deal with a reputable vendor, only release on a day above 60 degrees and in the middle of the afternoon so they have time to find something to eat before they must find a place to roost for the night. Doves – Similar to butterflies. Choose a reputable vendor and practice with them (before the ceremony) so you know the correct way to hold and release them. Bells or other noisemakers – Perfect for venues which don’t allow anything to be thrown, but be sure to let the little ones know they’re just to ring and not to throw! Confetti – Can be bought in a variety of colors and glittering effects. However, it’s notoriously difficult to clean up even with vacuuming. For this reason most locations probably won’t allow it. On the plus side it can come in a variety of shapes and be great for a theme wedding even just spread out on the reception tables. Sparklers – Fantastic effect for an evening wedding. Get the larger ones so that the sparkle will last longer. They also make them with a wood center (rather than metal) so they are safer for youngsters. Flower Petals or Lavender – Very romantic and beautiful to see a shower of petals/buds. They are easier to clean up then confetti and without the hassle of birdseed getting in your hair. The trend these days seems to be delaying selection of the officiant until very late in the wedding planning process. Puzzling as the union cannot be solemnified unless an officiant is present. This indicates to me the celebrant should actually be one of the very first people you hire. I recommend you do so with great care and consideration. I urge couples to first retain their officiant, next reserve the venue and proceed from there. Perhaps since so many weddings are performed secularly these days, people often do not know how to interview, hire and relate to their wedding officiant. Simply put, he or she should be treated the same way you would a member of the professional clergy. I was brought up with the old adage “manners can be fun” and with that in mind, ask you to consider inviting your officiant to both the rehearsal dinner and the reception. Your celebrant may not always be able to accept, but the offer is a nice courtesy and if desired he or she can offer a short blessing or invocation at the beginning of the meal or festivities. Traditional etiquette dictated a formal invitation be sent to the officiant, including an invitation to dinners and receptions, but verbal requests are acceptable. Invitations indicate courtesy and eliminate awkward situations and schedule conflicts. Please do not simply expect an officiant to stay after the ceremony without expressing your expectations prior to your wedding day. Officiants are most comfortable with a formal invitation. Besides helping keep track of scheduling and making expectations crystal clear, your officiant will appreciate the keepsake. Many times the officiant will either politely decline or stay for a short time for a “cocktail hour” and decline the full meal at a formal reception. I myself appreciate the rehearsal dinner for the opportunity to “bond” with the families. I generally simply stay for the cocktail hour at receptions and then…I’m on my way. Though it is nice to have the option to stay longer. If you do want your officiant to be part of the reception and the officiant has accepted the invitation, try to seat the officiant with like minded people. Throughout the wedding planning process hopefully you will have formed a relationship with your officiant and have an idea what kind of person he or she is. If you feel your officiant has done an exceptional job, by all means express yourself with a gratuity. Officiants probably charge the least of all the wedding vendors and most pour their hearts and souls into the ceremony. We do not just do it as a job; it is a calling and an experience. If the ceremony is particularly pleasing, gratuities are a concrete way to let officiants know you appreciate what they did and honor their contribution to making the day especially meaningful. Please know and remember that I am there for you 100%. I have absolutely no qualms about being asked a million questions about anything. I can always help where the vendors come in. 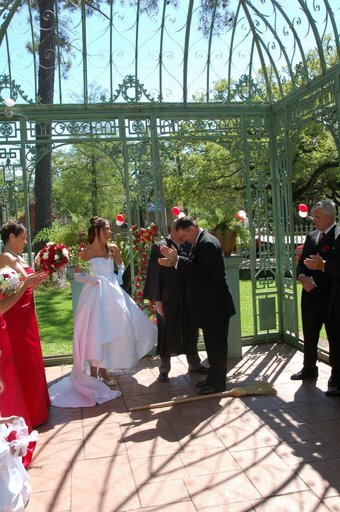 “Jumping the Broom” at a wedding is a custom that has lost its origin but adopted widely in England and the USA. It is believed to be from a West African practice brought by slaves to the southern United States but adopted by many local people who could not find or afford a civil or religious celebrant of marriage. Some think the Roma culture also had a similar tradition along with some Celtic tribes. From where ever it came, it is now part of our wedding ceremony traditions and incorporated in marriage ceremonies in many places. Couples like to vary what is said and done at their wedding, whether it be a special ceremony like giving a rose to mothers, a “Unity Candle”, or a wine ceremony. Using a decorated broom to jump just for the fun of doing a different tradition during the service has caught on locally. I have used it in many informal weddings I have done over the past 18 years as a wedding officiant and each time it gets a laugh from the people watching. It is said who jumps the highest is the head of the new household but a man in slacks has the advantage. Some couples like to decorate the broom in meaningful colors or flowers and may include a story about who will be in charge of the broom after the wedding. Adding interesting elements to a wedding ceremony makes it a little more special for the occasion.